The festive season is here! 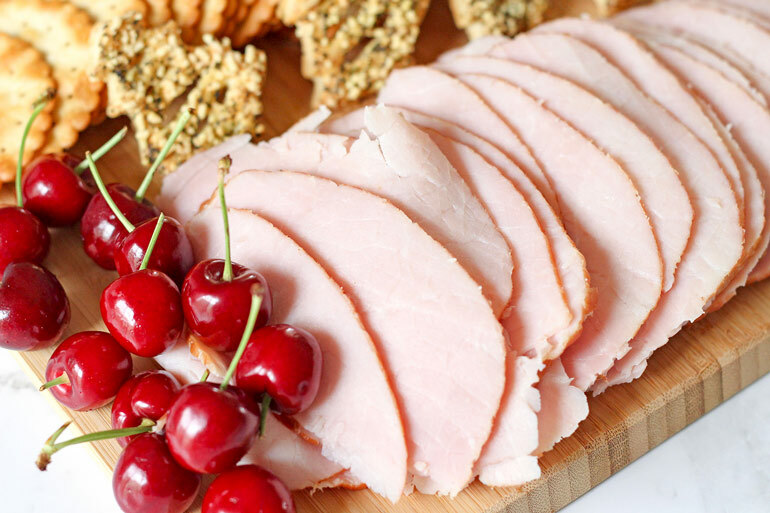 Here’s how to put on an easy and mighty delicious spread for friends for under $100. It won’t bust the Christmas budget. Plus, ANYONE can do it, no chef hats required. Is there anything better than a grazing gathering? 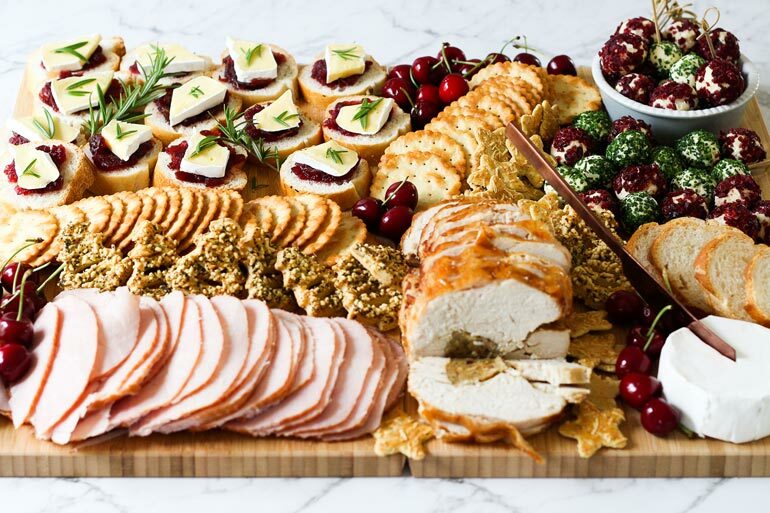 Let’s be real, putting all the food out in a mouth-watering spread like this means you’re not stuck in the kitchen all night. Enjoy some down-time with friends instead! 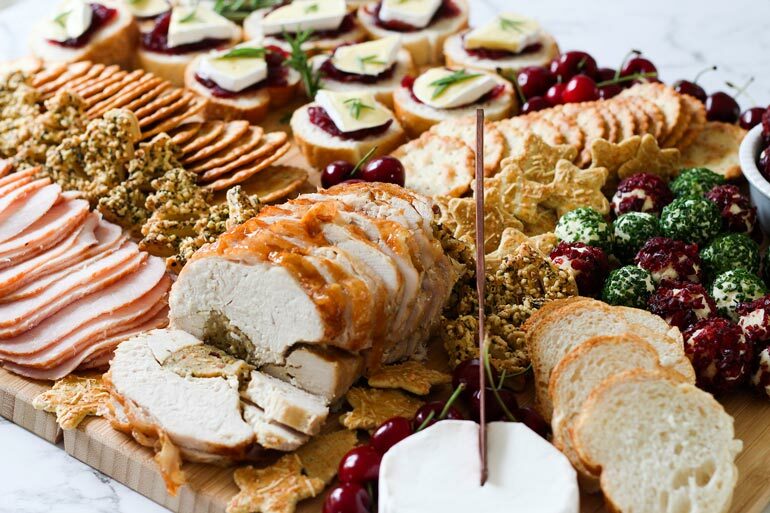 My top tip for putting together delicious grazing platters is to buy as much as possible already done – just unwrap, slice or scatter where you can. But to make it a little more special and put your individual stamp on it, include some of your own recipes if you have the time. Make a mean dip? Whip it up! Cheese balls your forté? Get rolling! Without further ado, find yourself a couple big boards (chopping boards are totally fine!) or platters and let’s get started! We’re creating TWO boards for a light grazing feast, just the ticket for drinks and nibbles! Shake up a savoury grazing board and keep it interesting with cold food options AND a couple of warm ones too (think warm dips, cheese fondue, chicken kiev balls and so on). You can save on time and stress by choosing foods that are ‘heat and eat’, where the oven does all the work. It’s well worth scanning the supermarket fridge and freezer sections for quick, tasty fixes! Woolworths Ready To Roast Turkey Breast will have everyone going-back-for-seconds. Easy to prepare, (just unbox, peel plastic off and roast) it’s pre-stuffed, ready to cook and cut for just $17. 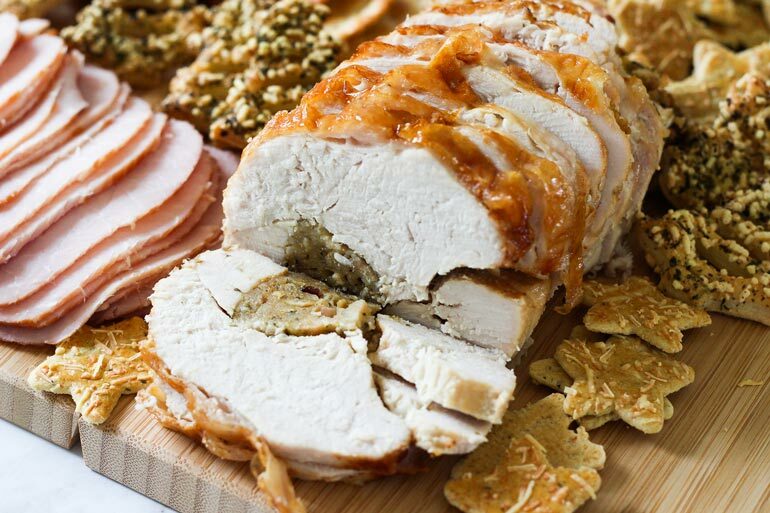 Defrost it in the fridge the day before and roast it in your oven (or even your airfryer) for a delicious and no fuss turkey roast. Packed with gorgeous apricot, apple and cranberry stuffing, it’s a definite winner. Christmas is no time for just one meat selection, more is more after all. So I’m taking full advantage of a gorgeous Woolworths Hickory Gourmet Smoked Ham, offering generous slices of Christmassy-goodness. The light smoky aroma is positively mouth-watering. 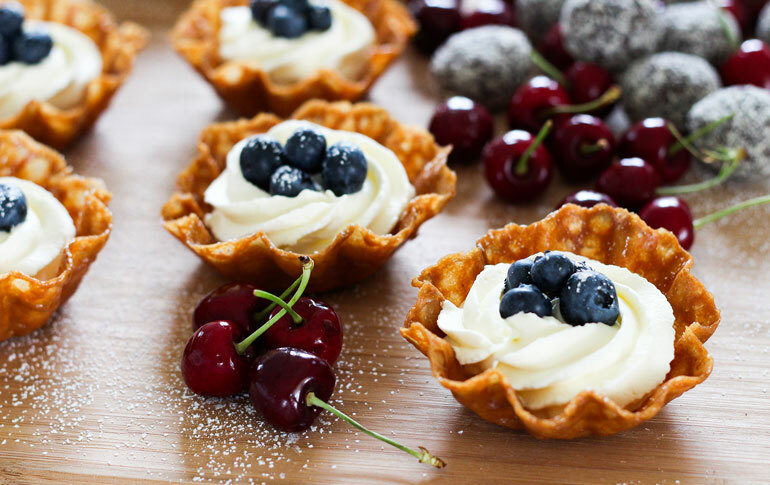 You know you can create delicious canapés with the most basic of ingredients, right? 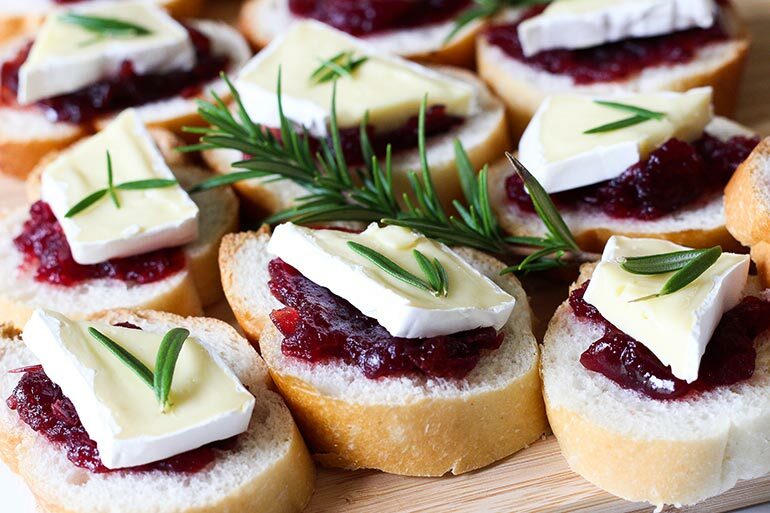 Here I grabbed a Woolies baguette, sliced it on the diagonal (I know, FANCY), topped it with a (*cough*) small generous spoon of deliciously thick Woolworths Select Cranberry Sauce, a wedge of Woolworths Select Brie Cheese and finished them off with a garnish of rosemary. It’s PRACTICALLY an artisan sandwich and anyone can do it (even those who don’t cook). Yum! I have a secret…my sister-in-law is actually the Queen of Cheese Balls and here’s a slightly tweaked version of her recipe for you – just don’t tell her I’m giving it away! Simply mix 125g cream cheese, 125g finely grated Tasty cheese, 125g finely grated Dairylea Cheddar cheese, 1tsp gherkin relish and 1 finely chopped onion together. 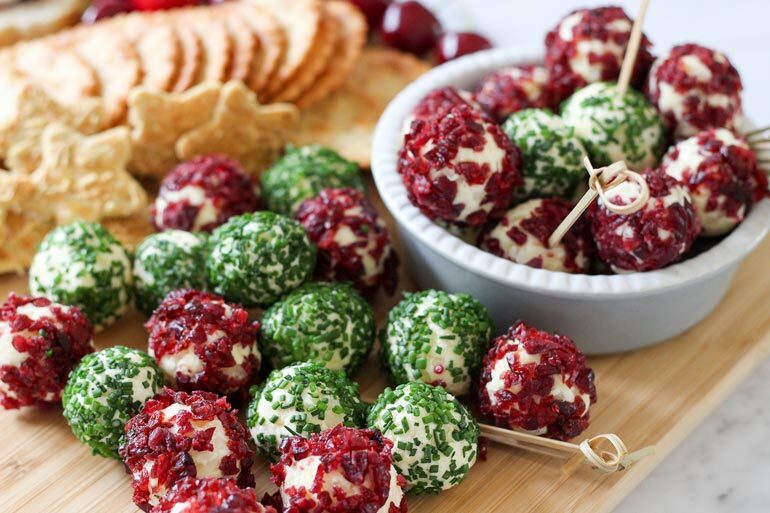 Roll into heaped tablespoon size balls and coat in either finely chopped fresh chives or finely chopped dried cranberries to coat (or both!). Serve with crackers or pretzels. Soooo good. You absolutely can be a little extra at Christmas. Don’t settle for everyday average savoury nibbles when there’s Woolworths Festive Pretzels (available 500g for just $5!) or Woolworths Puff Pastry Savoury Biscuits to choose from. Add Woolies delicious own brand range of affordable Sea Salt Crackers and by all means, add some fresh fruit (The Odd Bunch cherries are fantastic in both quality AND price!). Being Christmas and all, the store shelves are positively BULGING with all manner of delicious, must-have-one-of-everything sweet tooth pleasing treats. In true festive spirit, there’s no such thing as too many sweets. 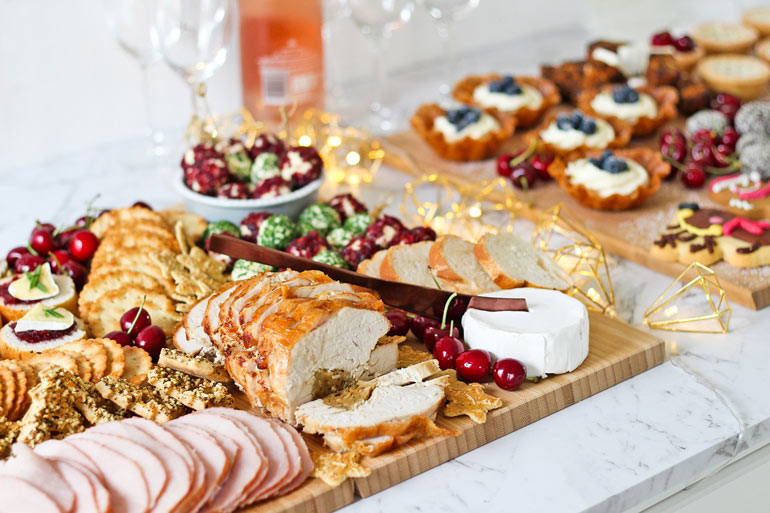 Creating a beautiful sweets platter is easy and SO quick – it takes longer to let the wine breathe than to put this spread together. 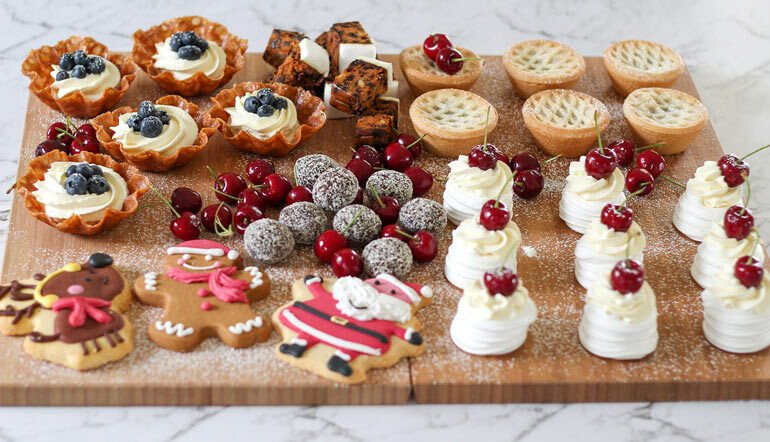 You can’t possibly have a Christmas dessert platter without all the traditional festive treats. 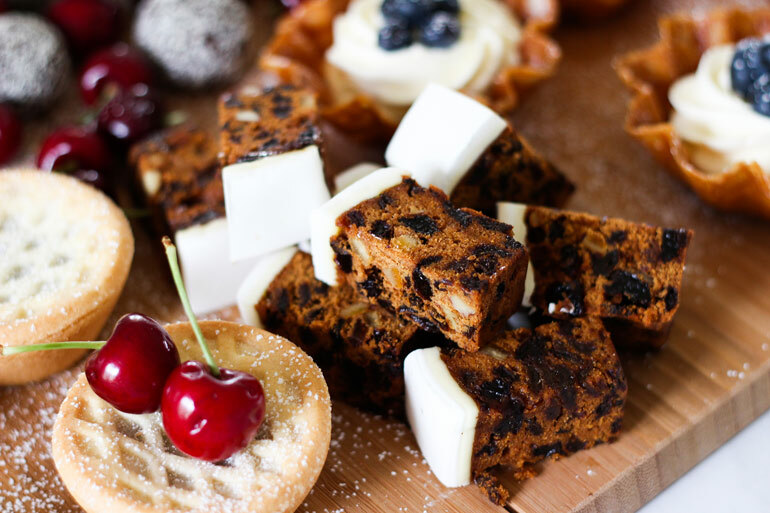 Fruit mince pies, rum balls and fruit cake up for the taking? Kudos to Woolies for selling smaller portions of fruit cake too, so you can add plenty of variety to the plate. Back in the day there was only ever one fruit mince pie variety to choose from. Not so anymore! 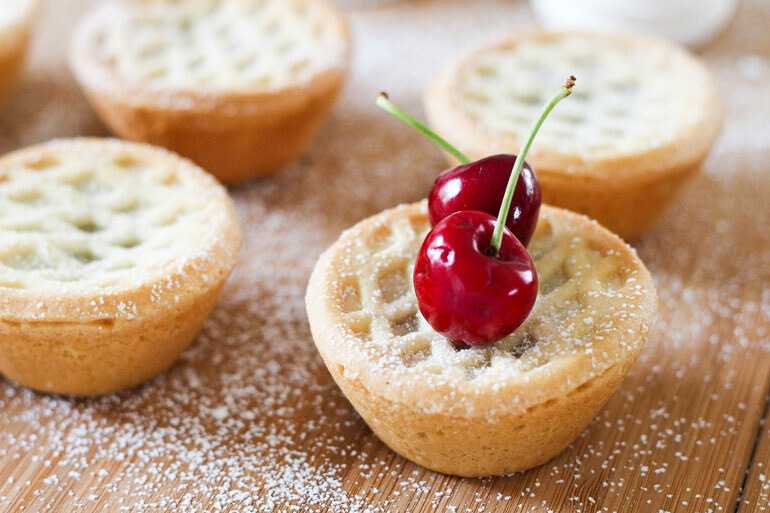 Woolies has Fruit Mince Pies and Summer Berry Mince Pies, for the value packed win – they’re both just $3.50 for a pack of 6. Pavlova in just minutes? HECK YES. 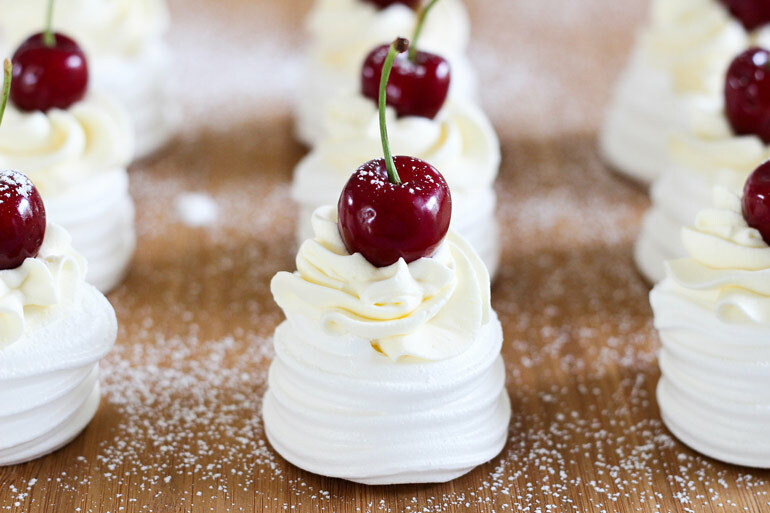 Have your cream already whipped in a bowl and your fruit sliced in the fridge so all you have to do is quickly dress the Woolworths Petite Meringue Nests with cream and fruit, then sprinkle with icing sugar. SO easy, quick and CUTE. 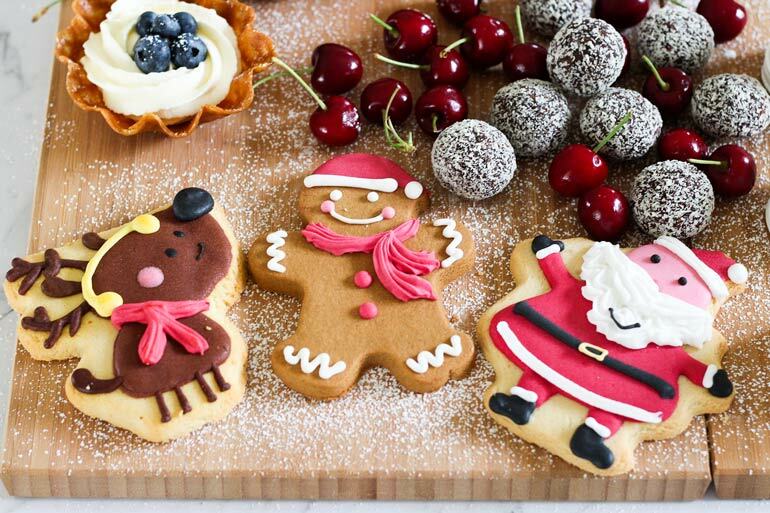 Speaking of cute, amp up the Christmas level with a few Woolies Iced Christmas Cookies ($1.50 each) on your board. I’m also going to leave these out for Santa on Christmas Eve, perfect! Brandy snaps ($5 for 8) and Brandy Snap Baskets ($5 for 6) are pure happiness, are they not? Fill them with whipped cream, top with a little fruit, sprinkle with icing sugar and you’re ready to serve them (and all without any burnt fingers, phew). 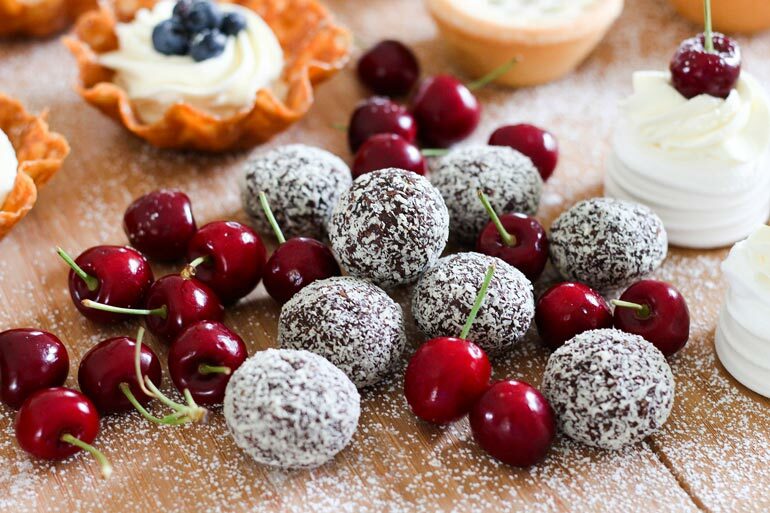 Fill in any gaps with small extras like Woolworths Chocolate Rum Balls, Woolworths Puff Pastry Sweet Biscuits, candy canes or chocolate gold coins – anything you like! You can even raid the pantry for nuts, dried fruit and seeds to add. 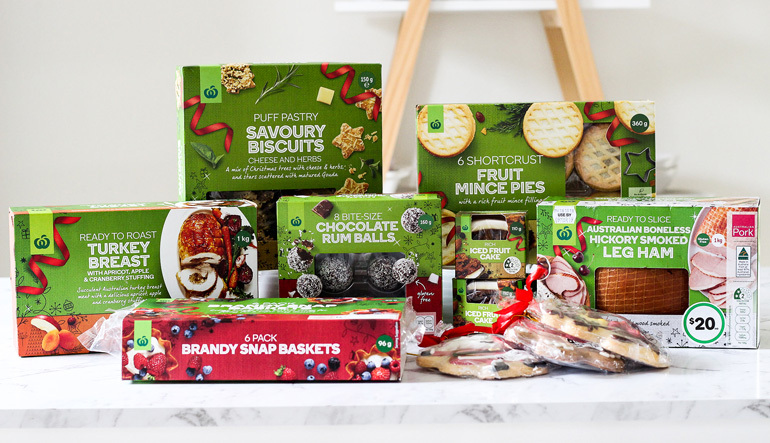 Woolworths is making Christmas easy for every family and every budget. It’s all too easy to get caught up in the hype of Christmas and throw your entertaining budget right under Santa’s sleigh. Keep your budget under control by shopping Woolworths own brand – the quality is magic, JUST LIKE CHRISTMAS! This is a sponsored article for Woolworths.